Ruth knew that dress, she was certain of it: black satin sheath, full-length, with a peacock splaying his obsidian-beaded tail from the young woman’s waist to her toes. Even on a grey Seattle afternoon, the dress somehow found enough light to shimmer as the woman wearing it walked down Rainier Avenue. Ruth surprised herself by crossing the street and heading toward the dress. She ignored the stitch in her hip, as well as all the other shopping she had to do before the showers they were predicting, and stepped onto the sidewalk a couple of paces in front of the young woman. The woman—a girl, really—popped her earbuds out. “‘Scuse me?” She was younger than she’d seemed from across the road; perhaps the short, black bob with high-cut bangs was what did it. She was, in fact, about the same age as Ruth had been the first time she tried the dress on all those years ago. Ruth blushed. She wasn’t normally this kind of person, striking up conversations with strangers. She wouldn’t even have dared to walk into the boutique where she’d first seen the dress if not for her friend Mona. Mona was like that, bold; strutted right in even though both of them together couldn’t have afforded a single stocking in the place. The girl said the name of a store Ruth had never heard of, which had records (“actual vinyl!”) and vintage jewelry and sixties furniture and “all kinds of stuff.” Ruth was sure she wouldn’t remember any of it, distracted as she was by the crystal chip in the girl’s nose and the flash of lime gum as she spoke. Ruth noticed that one of the shoulder straps was frayed, and a few beads were missing from the tail feathers. What’s more, the silk was slightly faded and discolored at the bottom. 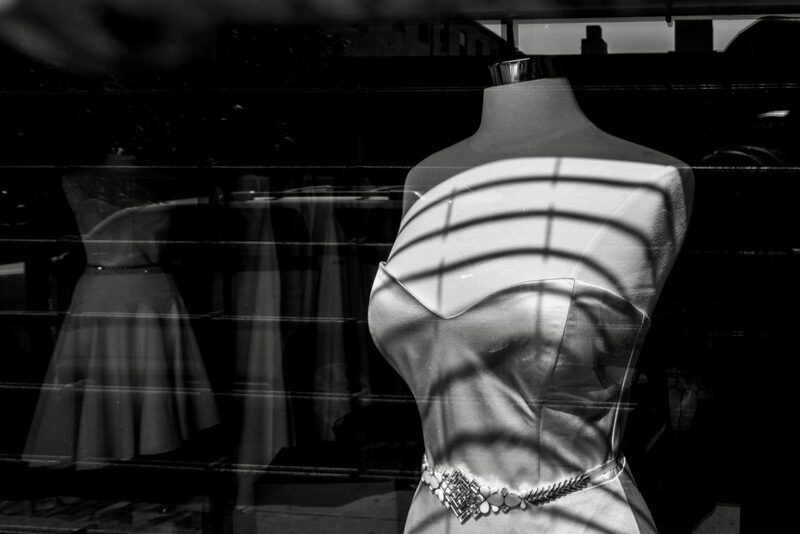 Still, her mind wandered to all the special occasions, all the balls and parties she’d dreamt up for the dress while she stood in front of the boutique mirror. She’d turned from left to right, watching light flash off the proud beaded peacock and slide over the curve of her hips. She turned and looked at Mona then, hoping to see a similar gleam in her eyes. If anything, she thought, this dress could do it: convince Mona to slide her arms around her and admit how she truly felt. The girl’s eyebrows shot up. The puzzlement on the girl’s face changed to curiosity as she considered it. Back in the boutique, Mona had simply shaken her head—quietly, subtly. Devastatingly. Whether it was “no” to the dress or to her, Ruth never had the courage to ask. Instead, she simply went back to the dressing room and let the loveliest thing she’d ever felt slide down her body to the floor. A drop of rain pelted Ruth’s hand. She still had so many things to get done before the skies opened up again. The dress wouldn’t even fit her now, and she had no one to give it to. And yet, she waited—chest humming, the feel of silk around her hips, the peacock winking his jet-black beads—for the girl to say yes. Enchanting story. I can visualize that gorgeous dress! Thanks for sharing this.